White Roads is a collection of 32 poems, carefully ordered in 5 sections, each fronted with its own epigraph and thumbnail drawing by Silvana Biasutti, whose intricate work also features in full page images throughout the text. The first thing I noticed was the beautiful binding, with an illustrated, textured dust jacket. The book is a pleasure to handle and to look at, and a delight to read. 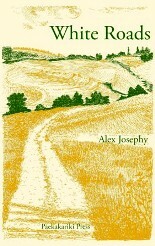 Josephy has a knack for zooming in on small things, gazing with an outsider’s eye: objects such as teacups on tablecloths, the ‘violet glow / of the Insect-o-Cutor’; and the abstract made concrete, with rhythm reflecting meaning, in ‘Days / stretched out to weeks, / measured in sacks’ in “I Muratori”. In “Aerial”, I particularly liked the image of this ordinary, often overlooked object as ‘a silver stick insect’. A stand-out poem, for me, is “La Bisca Clandestina”, a prose poem, capturing, in half a page, a scene of ‘seven pinafored women’, players in a card game. Their conversations range from ‘Pippa Middleton’s winter hat’, to ‘Wolf tracks in the woods across the valley.’ The poem focuses closely on the seven women, zooms out to the inhabitants of other apartments near to the room where they are playing, then out again into the street, cinematic in its sweep. I also enjoyed “L’Ospedale”, which perfectly captures the slow pace of country life. A doctor takes his coffee, leaving his ‘black bag’s grimace’ open on ‘a marble table’, while ‘Your bleeding finger seeps, darkens / a dishcloth.’ There is no hurry, no anxiety: ‘You have the scarlet geraniums […] What more could you want?’ I love the contrast of the slow drinking of coffee with an ambulance crew: the emergency team, but no one is rushing. The collection ends with poems on plants, including a love poem: “Radichio Trevigiano, I Love You”, which is a prime example of what Robert Vas Dias, on the inner back cover, describes as the poet’s attention to ‘minute particulars’. My copy of White Roads is marked 179/250. I highly recommend that you seek out this book before all 250 copies are gone.